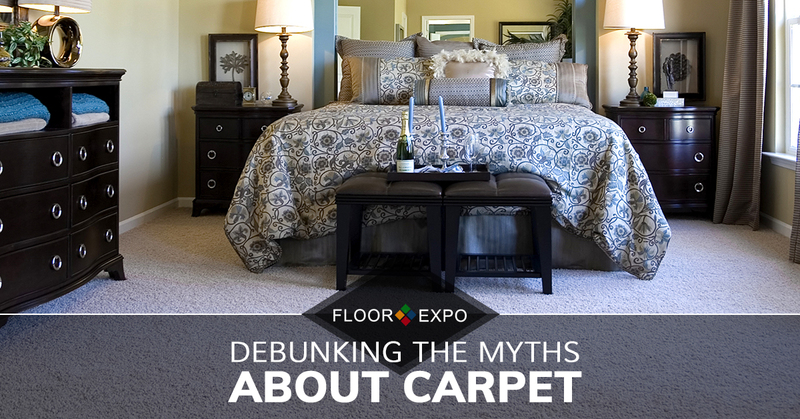 There are so many myths about carpeting. Myth #1. Carpet is impossible to keep clean. Carpeting has a bad reputation for being hard to keep clean, especially if there are pets or kids in the house. And, while this used to be true, today’s innovative technology has made carpet better than ever. 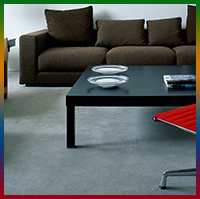 There are plenty of modern carpet options that are equipped to resist stains, foot traffic and other wear and tear. SmartStrand Forever Clean by Mohawk, for example, features Nanoloc™ technology, which provides the ultimate protection against spills and stains. Of course, if you never clean your carpet, you won’t be happy with the results, but if you vacuum regularly and get your carpet professionally cleaned once a year, you won’t have to worry about your carpeting constantly looking dirty. Myth #2. Carpet is a bad idea for homes with people who have allergies or asthma. Unlike hard surface flooring options — like hardwood, tile, vinyl and linoleum — dust, dirt, pollen and allergens can’t just be easily swept away with carpet. In fact, it’s the only flooring option that actually locks pollutants into it, which is why so many people believe that carpet isn’t ideal in a home where people suffer from allergies or asthma. But, the opposite is actually true. Carpet is ideal for homes with allergy or asthma sufferers because it traps and immobilizes allergens and debris, where they can be safely vacuumed away using a vacuum cleaner with a HEPA filter. Myth #3. Carpeting is prone to mold or mildew growth. In order for mold to grow, it requires three things — moisture, the right temperature and a food source. Most interior spaces provide the right temperature for mold to grow, and there are many things that act as a food source to mold, including wood, clothing, wallboard and, yes, carpeting. If all three of these conditions are met, mold can grow, but the problem is not with the carpeting, it’s with the moisture. No matter what flooring type you have in your home, whether it’s hardwood, linoleum, vinyl, tile or, yes, carpeting, if moisture is not an issue, you won’t have to worry about the growth of mold or mildew in your home. Myth #4. Carpet is outdated. When many people think of carpet, they imagine that long, shag carpet that many people loved in the 60s and 70s. This idea that carpet is outdated is just another myth that has no basis in the modern world. Carpeting isn’t what it used to be, and today, you have more options than ever before when it comes to the style of carpet you have in your home. Carpet comes in hundreds of thousands of different patterns, colors and textures, which will make it easy to find a carpeting option that can enhance your home’s existing style. But, you don’t have to take our word for it! When you stop by our flooring showroom in Fairfield, you can take a look at the many different carpet options we have at your disposal. Floor Expo is proud to be your premier carpeting professionals in New Jersey and beyond. We hope that this blog has cleared up some of your worries and hesitations about having carpet in your home, and to learn the truth about more carpeting myths, make sure that you stay tuned for our next blog. In the meantime, if you’re ready to start experiencing the benefits of carpet in your home, turn to the professionals at Floor Expo today! Our showroom is stock full of carpeting options for you to choose from, and we even offer free design consultations! Schedule yours today!